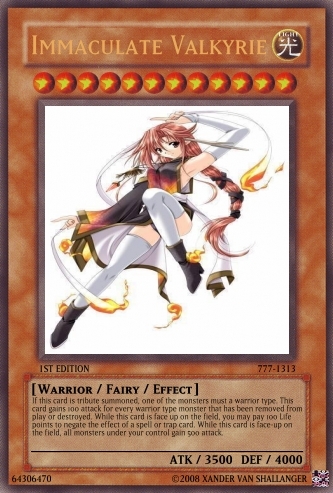 Only Admins may use this except for the exception below"
Effect: If this card is tribute summoned, one of the monsters must be a warrior type. This card gains 100 attack for every warrior type card that has been removed from play or destroyed. While this card is face-up on the field, you may pay 100 life points to negate the effect of a spell or trap card. While this card is face up on the field, all monsters under your control gain 500 attack. Nobody can use the following cards except the following exceptions. Effect: "Uria, Lord of Searing Flames" + "Hamon, Lord of Striking Thunder" + "Raviel, Lord of Phantasms"
This card cannot be Special Summoned from your Fusion Deck except by removing from play the above cards on your side of the field. (You do not use "Polymerization"). This card cannot be destroyed by battle. During your Main Phase 1, this card gains 10000 ATK until the End Phase.